Fish has always been a staple at our house. My mother prepared fish all sorts of ways: baked, steamed, in soups, grilled and even broiled. I liked it best when my mom would deep fry the fish. Most of the time, my mother would take and deep fry the whole fish. Sometimes, she would cuts the fish into steaks and fry them up. Very rarely did she fillet the fish and fry them up like “fish and chips.” It wasn’t until my brother started fishing and filleting the fish. By then, it was my brother who was doing the frying. He liked to coat the fish cajun or “louisiana” style. The fish always came out tender — and with a kick. Here’s my version. If I’m using fish fillets that I bought at the market or fillets that have been frozen, I like to start out by soaking the fish fillets in milk. It gets rid of the fishy odor that you may get when you fry. I also use Panko to make the fillets crispy. Soak the fish pieces in milk for at least 20 minutes. In a small bowl, whisk together the egg and hot pepper sauce. In a separate bowl, stir together the flour, cornmeal, pepper, mustard and Cajun seasoning. Dip fish pieces into the dry mixture, then into the egg, then back into the Panko. Set aside. When all the fish is coated, place fish in the refrigerator and chill for about 15 minutes. Heat enough oil to cover the bottom of a large heavy skillet over medium-high heat. 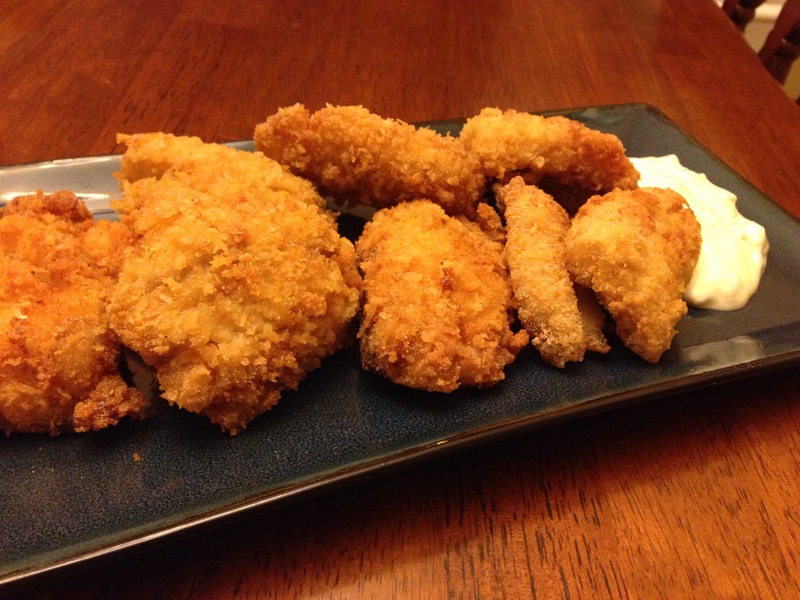 Fry fish pieces for 3 to 4 minutes per side, or until golden brown. Drain the fish on paper towels and serve with hot sauce or tartar sauce.